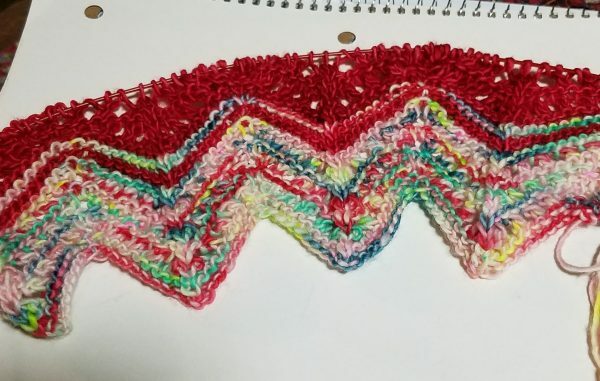 Yesterday evening I got started on my Adventurer Scarf. There are 24 mini skeins that have to be wound. I thought . . these are small, I can wind them by hand and not have to go to the sewing room and do it. I wound the first one by hand and realized I could wind all 24 on the swift and ball winder than I could wind one by hand. I went over to the sewing room and wound the big skein, then wound the red skein. Even though it was a mini, it got tangled and between the tangles and Boots’ help, it was a slow process. The one I wound by hand was the dark pink that I had planned to use for #1 but then changed my mind so I only had two I could use and I did both of those last night. It’s going to be pretty. So many times I have on jeans and a solid shirt and this scarf will be great to wear with those type outfits. A friend from home called and I talked to her for a long time. Vince and I had all kinds of things to talk about before I put my headphones on to listen to a book and he watched a couple of TV shows he likes that I don’t like. Another friend who is going to move from near here to East Texas in the next year or so wanted to talk about solar panels so she and I chatted online for the longest time. It was a good evening! My 14 year old grandson asked “What is it with all the scarves?”. I told him that girls liked pretty things like scarves and jewelry. I didn’t tell him that when you get older you need them to cover the wrinkles in your neck! That is a beautiful scarf – just added it to the ‘to do’ list. I’m going to have to add to my mini-skein stash first. Beautiful! Yarn and pattern. You have finally got me!!! This shawl is being knit mentally; I hope reality works as well for me!